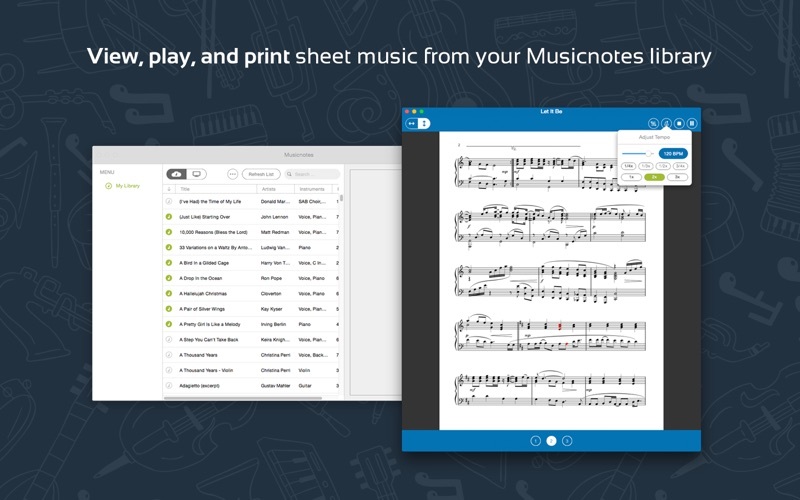 Enjoy an unparalleled digital sheet music experience with Musicnotes Sheet Music Player for Mac. 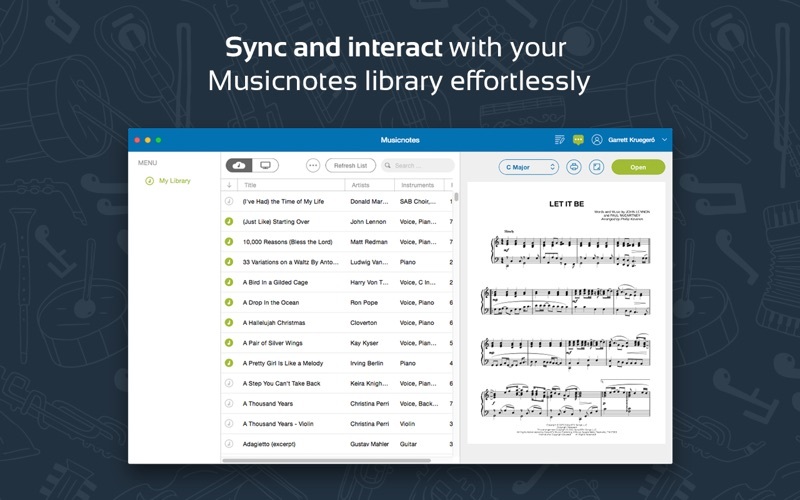 The Musicnotes Player allows you to preview, transpose, play and print your sheet music and guitar tab from your desktop. 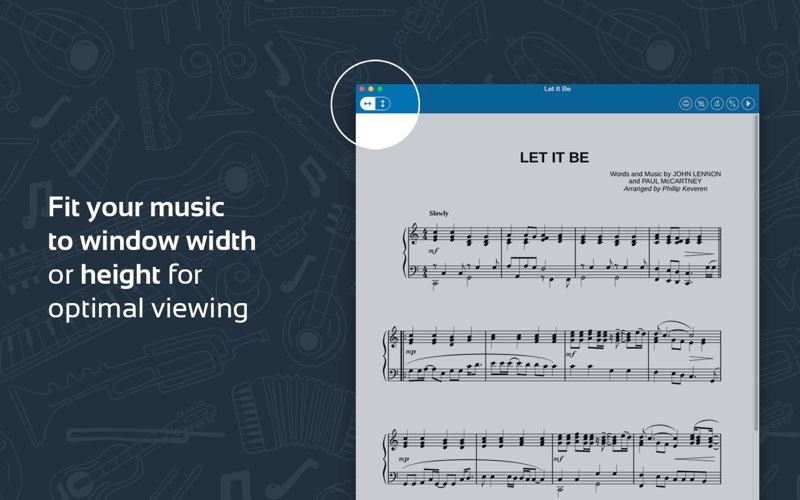 Use the Sheet Music Player's audio/visual playback feature to listen to and practice along with your Musicnotes digital sheet music and guitar tab files. 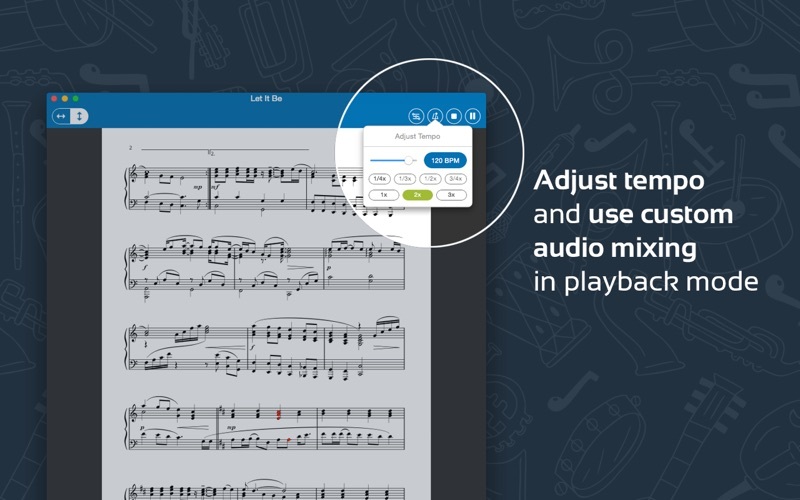 Customize your playback with adjustable tempo, key transposition and audio mixing to selectively mute or change the volume of any part of your sheet music. We'll even help get you started with seven free songs. Features: - Audio mixer - Adjust your tempo - Easily sync your entire Musicnotes sheet music and guitar tab library - Seven free bonus songs (see titles below) - High resolution viewing - AirTurn & Page Flip pedal support - Print your Musicnotes sheet music purchases Includes these free sheet music selections: - "The Big Rock Candy Mountain" - "All The Pretty little Horses" - "Hello! Ma Baby" - Chopin's "Prelude in Db Major" (Raindrop Prelude) - Scott Joplin's "The Entertainer" - Harry Von Tilzer's "A Bird In a Gilded Cage" - "London Bridge Is Falling Down"
Being a guitar player and familiar with Guitar Pro and some of the fairly powerful music viewers for that I expected some level of functionality from Music Notes. Not for it to necessarily be that in depth, but I mean even really basic stuff like skipping to a section in a song seems to be missing from the OSX App. It's truly unbelievable that if I want to hear a section of the song at the bottom of the page I have to play it from the top. And if I want to reduce the tempo and practice a looped section? Nope, not on the computer for some reason, better pull out the phone with the iOS Music Notes app for that. Such a joke. Use Music Notes for the paper sheet music, but if expecting any sort of digital functionality then look elsewhere. I am not able to view my music on the app once it has downloaded. I am hoping that there will be an update soon. Impossible to study before printing and trying to read music on an iphone screen. Mac users are having difficulty using this app, since Apple's Mojave update. It would be great if Musicnotes could be updated this year, as it was a very useful app in the past. Good app. Love the markup tools, but it desperately needs to add Apple Pencil support. Otherwise, I find the features helpful. For what I do, learn particular songs, this app is a good aid. You organize your music, modulate between keys, modify the tempo , adjust music settings for guitar chords only. It’s also pretty intuitive. I haven’t experienced any of the anomalies that I’m reading about in others’ reviews. So I’m on board with the service—the printing from the URL as well as the app. I’m pleased that the app plays the chords and melodies, even if the page turns are clumsy and don’t respond in real time. But, it is crashing in MacOS High Sierra (10.13).. Please send us an update! 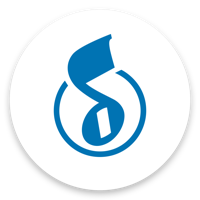 There are quite a few publishers providing paid sheet music and Musicnotes is one of them. I have been buying sheet music from Musicnotes and other publishers for years. Musicnotes sheet music is excellent. Their purchase price is on par with any other publisher and the restrictive printing policy is part of the industry, not this or any other company. This app works exactly as described. Providing an app to organize music they publish is a feature. Maintaining that app on the app store is indicitave of the quality of the company: Apple vets apps you download here which protects you from malware. Transposing limited, worked for my needs but why not every key? The playback feature is a great concept, abysmally executed. It can’t rewind, loop, skip… what were they thinking? This is as primitive and featureless as software can be and still be called software. Amateur effort. I will look for other publishers who take some pride in their product and show a little more interest in their customers. Not sure what else to say—I am connected to the internet but when I try to sign in it says I need to connect to the internet. There does not seem to be a way to troubleshoot this problem.